Misty's Musings: Did He Grow Up Under A Rock? Sometimes, I can't get over how much of a deprived life my husband has led. It is mostly because he has always been working and never had time for anything else. One of the first examples of this was our first Christmas together. It was the holiday season, and he was still trying to pretend that he wasn't the Bah-Humbug Scrooge that he actually is. We were decorating the house, and a commercial for a Christmas special came on the TV. I made the comment, "Oh, I have to find out when Grinch is going to be on." I said, "You know, The Grinch Who Stole Christmas?" Hubs, "OH! I've heard of it"
Me, "You've NEVER seen the Grinch???" Hubs, "No, isn't that with Jim Carey?" Me, "NOOOOO! You've never seen the ORIGINAL Grinch Who Stole Christmas???" Me, "How can you have had THREE children! Three children! And NOT see the Grinch??? Did you grow up under a rock??? Did you raise your kids from under that rock???" We were discussing Tag, a.k.a. That Dog which is how everyone else so unlovingly refers to him. Me, "Hubs, I'm thinking we need to work on Tag's issues a little bit." Hubs, "I like him being protective of us and the house." Me, "Yeah, well, so do I, but when we ask someone into our home, then Tag needs to learn that it's OK and to back off." Me, "And when he bites someone?" Me, "Are you even listening to me???" Me, "Hubs!! People are afraid to come to our house and visit, because they think we have Cujo living with us!" This is where the conversation took on a whole new subject! Me, "You don't know who Cujo is?" 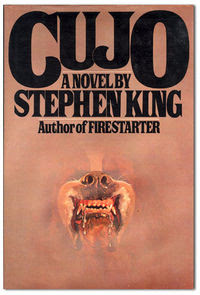 I run to the bookshelf, pull the Stephen King novel from the shelf, run back and put it in Hubs' face "You've NEVER even heard people reference Cujo?" Hubs, "No, looks like one nasty dog though!" Me, smacking forehead, "Did you grow up under a rock???" Commercial for coffee comes on the TV. Me, "I can't believe how expensive a can of coffee is out here!" Hubs, "Yeah, you need a new coffee maker too." Me, "Yeah, wanna hear something silly?" Me, "You know how you have to shake the lid before you open it, and it makes that funny sound." Me, "Every morning when I hear that, I can't help but picture Fozzie Bear saying 'wacka wacka wacka'." At this point, the image of Fozzie makes me giggle like a little girl. And THEN, I notice it - the BLANK, I have NO IDEA what you are talking about stare. So, I stare back... in disbelief and just waiting. Me, "You don't know Fozzie Bear?" Hubs, "No, must have been after my time." Me, "Hubs, you have THREE kids! Fozzie was one of the Muppets." Hubs, "Ummmm, what's a Muppet? Oh yeah, that was what your Uncle T called you when you were little - "His Little Muppet"! Right?!!!?" Hubs is all proud of himself now because he thinks he answered the question right. Me, "Yeah, he called me that, but do you know why? Do you know who the Muppets are, Hubs?" Me, "Animal??? Crazy, silly, wacky, banging on his drums Animal? You don't know Animal? He was my FAVORITE!!!" Me, "Kermit the FREAKING Frog??? You HAVE to know Kermit!!!" Hubs, "Oh yeah, and that pig." Me, "So you DO know the Muppets!" Hubs, "You mean there were more besides that frog and pig?" Me, "For crying freaking out loud - Jim Henson is rolling in his grave! Did you grow up under a rock??? Did you raise your kids from under that rock???" My husband was raised by wolves. Never heard of Shrinky-Dinks, never saw "The Christmas Story," didn't know the words to "Twinkle Twinkle Little Star," for crying out loud. I felt so deprived, my mom never got me Shinky-Dinks. call the man in sick for a coupla days and have a dvd fest - though, cujo needs to be READ to be fully enjoyed. I could have gone my whole life not knowing who Cujo was!! Scary when I saw it at about 11 years old!! Yeah, he MUST have grown up under a rock. And I LOVED Shrinky Dinks!